R1445 Diagrip™ blades cuts medium to soft concrete, building bricks and blocks. Diagrip™ ensures an optimal distribution of the diamonds and holds them in the segment longer. This enables the blades to have superior cutting capacity, longer life and a smooth, rapid cut. 2 мм / 0,08 "
33 мм / 1,3 "
4,2 мм / 0,17 "
8 мм / 0,31 "
Diagrip™ technology which yields superior cutting capacity, longer life and a smooth rapid cut. 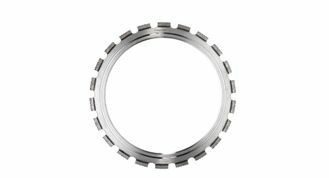 The self sharpen segments are designed to give a free-cutting tool regardless of direction of blade rotation. All ring saw blades are supplied with a patented drive disc.